Stranded without a phone is a new mobile game by Gilligames, which is a spin off from their other game, Space Horse. You basically play as one of the characters (free or paid), under one of the difficult levels (easy, medium, hard, brutal) and try to survive and get help to get out of the island. Four passengers on a space ship were on a mission to colonize a new planet when the ship crash landed on a planet that is almost completely covered by ocean. You are the only survivor - an upper-management executive from the Decoo corporation, the company that sponsored the original mission. Now you must use your survival skills to stay alive long enough to get rescued. Build shelter, find food and drink, and collect salvageable parts from the wreckage that wash ashore. Use the parts to build a space radio and call for a rescue team to win the game. Some of the items are quite a hassle to make, but the game is pretty self explanatory and easy to maneuver around. I like the achievements in the game as it keeps me on the right track. Also, the island interacts with you by presenting various objects when you wake - it's quite amusing to wake up to canned meat beside you! The main highlight in the game is finding and crafting resources. 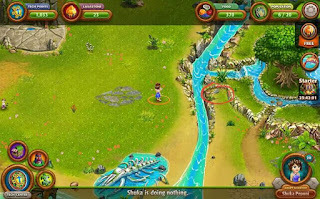 Given what an addict I am in Virtual Villagers Origins 2, this game is definitely for me! The end goal is to build a space phone to call for help, but there are other interesting things that can be made as well. You can get it in the Apple Store or Play Store.